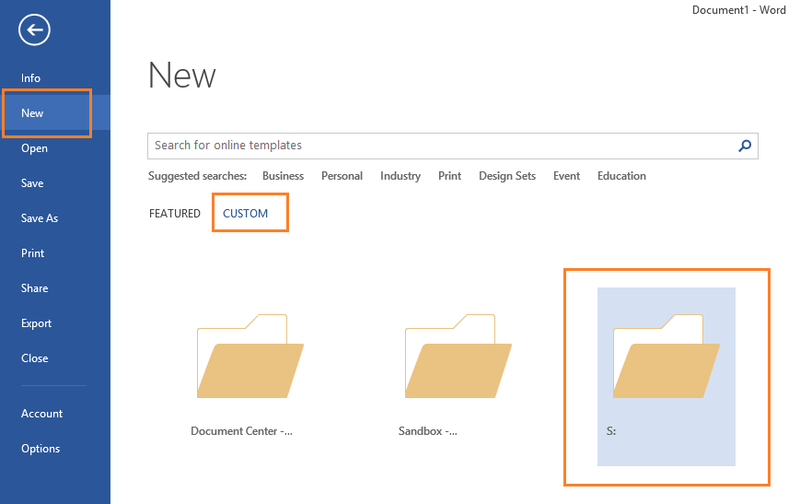 After performing these steps, the files stored in the SharePoint library can be used as templates in word, with working quick parts, and you won’t even need to open SharePoint to create documents anymore. Note: This works in both SharePoint on-premises, and SharePoint Online! Ok, so how do we do this? Make sure the site with the document library is added to your list of Trusted Sites. If using SharePoint Online, log into your tenancy, and make sure to remember the credentials. Right-click Computer and choose “Map network drive…” in the menu. Windows explorer should now be opened automatically, showing you the contents of the library. The next thing we need to do is set the Workgroup templates property in MS Word. This will make the given location be used as a folder for custom document templates. I am using Word 2013 in this example. But it should work for 2007 and 2010 as well, even if the paths may vary. Go to File –> Options –> Advanced (scroll to the bottom) and click the “File Locations…” button. Confirm all the dialogs and close Word. Go to HKEY_CURRENT_USER/Software/Microsoft/Office/15.0/Common/General Note: Replace “15.0” with your current office version. Confirm the dialog and close the registry editor. And now you are done, ready to use the documents stored in the library as templates! 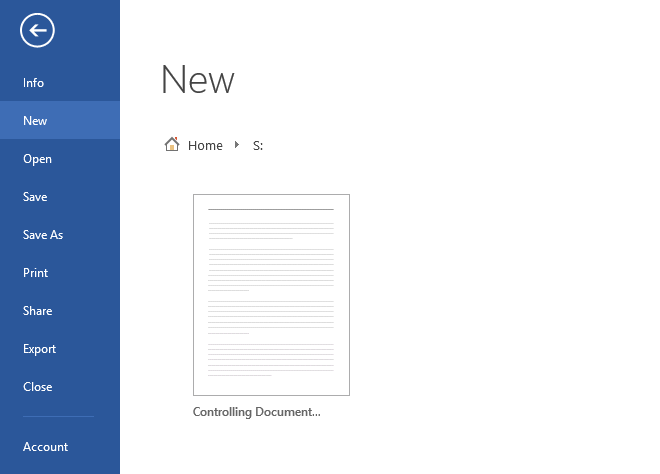 Open the S: folder to see all the documents stored in the library. Just click the one you want to use as a template. 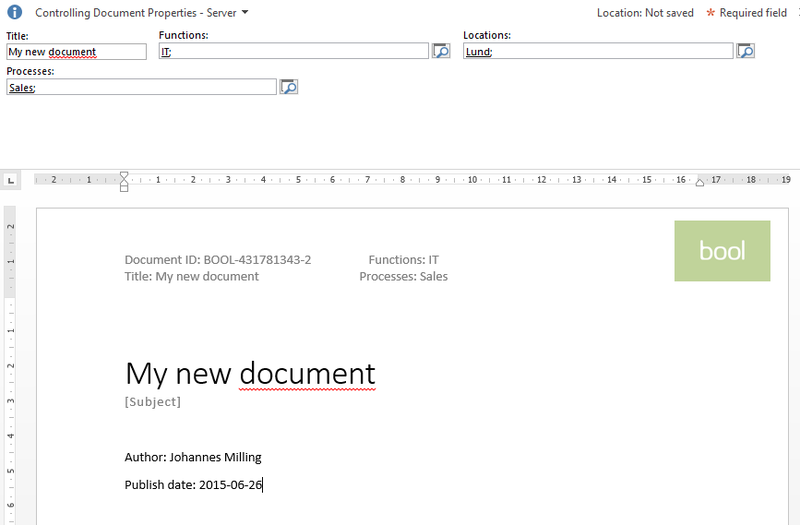 Word will now copy the document from SharePoint and create a new file for you, with SharePoint field references working perfectly. Easier to update templates. To edit the templates, you just need to edit the documents stored in the template library, rather than edit the template file connected to a content type, saving you a lot time, especially when adding/changing quick parts in the template. Create documents from Word, instead of SharePoint. Word is the program you use to edit documents, so why should I have to go to SharePoint to create a new one? Wouldn’t it be easier if I could create a new document from a template directly in Word? Yes it would. It would simplify the process greatly. Separation between Content Types and Template. Having a 1-to-1 relationship between Content Types and Templates is a system design mistake of epic proportions, and one of the reasons you cannot create a great document management system in SharePoint without customizations. Separating the two is a major win, enabling you to have a great number of templates without adding unnecessary complexity. Single Site Collection. This solution will ONLY WORK ON A SINGLE SITE COLLECTION! The templates will need to be stored on a library on the same site collection were the new documents will be saved. It can be on different web sites, but save it on another site collection and the fields won’t update inside the document, even if the content type is distributed through a content type hub. This means that the users need to know where to save the documents if they should work as expected. This basically means that you cannot have a document management system (DMS) consisting of several site collections, which you shouldn’t want to anyways. But this puts a limit to scalability. You can use archiving to keep your DMS site collection below the recommended levels, but it’s still more limited. There may be a way around this by ensuring that the fields SourceID and internalName attributes are consistant between site collections, but I haven’t tested it yet. I hope you give this a try. It’s a working (although not great) way of separating Content Types and Templates, which is something MS should have done a looong time ago.